This dog park in North Platte, NE offered lots of shade, even on a 90-degree day. Friends of ours are planning and building a dog park in their community. I am in awe of their energy and commitment; they’ve got the entire dog-owning community involved. Talking with them about their plans got me thinking about dog parks and some of the research I did with a college class I taught last spring. Dog parks can be a wonderful asset to city-dwelling dog lovers — or they can be rough-and-tumble, scary places. What makes the difference? Planning is one of the keys to successful dog parks. The dog park culture is another. This post will talk about the physical features that contribute to making great dog parks succeed. 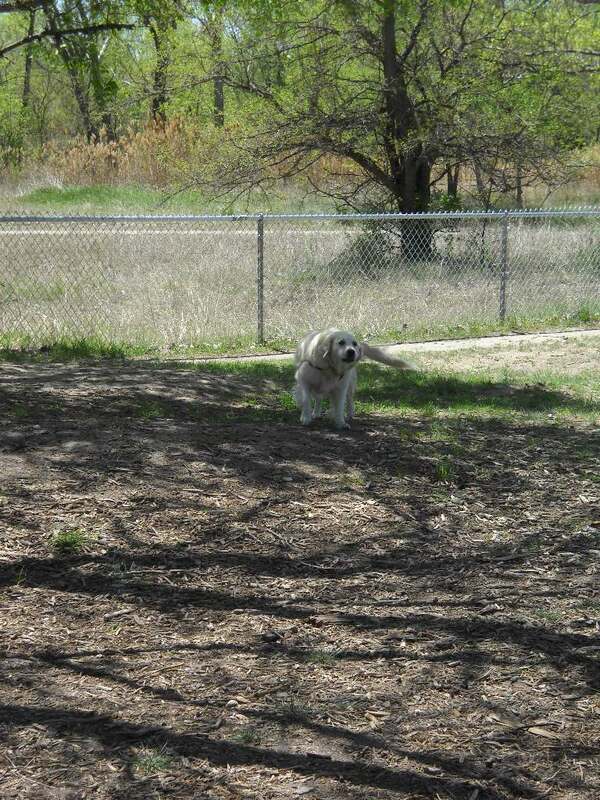 My next post, Good Owners Make Good Dog Parks, will delve into dog park culture. As anyone with a large, fenced back yard knows, just having enclosed green space is not enough to get dogs to exercise; many dogs will just pick a sunny spot and take a nap. But add more dogs and you have a potential problem: in a plain, flat grassy area, dogs are more likely to chase other dogs. Often, once one dog starts a chase, other dogs eagerly join in. Dog parks with natural or planned “breaks” in the open space are safer for dogs. They force running dogs to change direction or slow down, and give the “chasee” opportunities to escape. “Breaks” can be hills, paths, stands of trees or bushes, a pond or a beach. Benches can also break up open space, but benches encourage the humans to sit, chat with others, and not pay attention to their dogs — which contributes to bad dog park culture. Besides breaks, dog parks — especially in warm climates — need shade. Plans should include lots of shade trees or even a shelter with a roof. Water is a wonderful “break” and adds to the fun for the dogs. People tend to keep a closer eye on their dogs around water, too. If the space for a planned dog park is not on the edge of a natural body of water, consider a manmade pond! And of course, if there is a place to swim, a rinsing station is a great idea. At absolute minimum, a dog park should have a hose or fountain for drinking water. In dog park planning — and visiting — size matters! In a smaller dog park, particularly if it is crowded, dogs are more likely to feel stressed — which leads to defensive behaviors or could make them targets for dog bullies. In larger spaces, dogs who don’t want to play with the other dogs simply have more room to move away. Many urban areas have dog parks that are a half-acre (or less); for a large, high-energy dog, this is not enough room to really stretch those legs and burn off energy (I know; I live with a dog like that!). In smaller parks, it is essential to have a separate small dog area. Parks that are several acres and include walking paths or a beach can be safe for dogs of all sizes (so long as the humans are paying attention), but in smaller parks, it is far too easy for small dogs to be injured, even if all of the dogs are behaving appropriately. Dogs in full play mode don’t always pay attention to what’s in their path, and they can’t (or won’t stop on a dime. If you are choosing a dog park to visit, scope it out before releasing your dog. If it is small and crowded, you might be better off taking the dog for a leashed walk. On the other hand, if you are lucky enough to live near a large, well designed park, do what you can to ensure that the dog park culture will ensure a safe, fun experience for dogs of all sizes! Thanks to the APDT and Sue Sternberg for their wonderful Webinar, “A Look at Interactions Between Dogs in Public Dog Parks” for information referenced here.